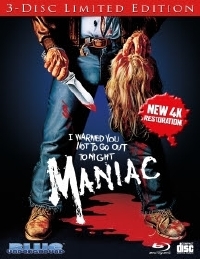 Blue Underground has announced that they will be releasing a limited edition 4K restoration of the horror classic Maniac directed by William Lustig and featuring the special effects of gore master Tom Savini. The new restoration comes from a recently discovered 16mm original camera negative and the release, limited to 10,000 copies, will include 2 blu-rays, a CD featuring the soundtrack from Jay Chattaway and loads of extras; a few of them never seen before! The release will also include a collectable booklet with new essay by Michael Gingold. Maniac will be released on December 11 but you can reserve yours today.